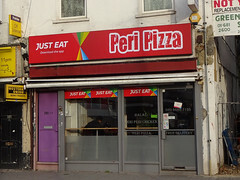 "Grill & cafe" in Croydon, offering takeaway and eat-in pizza and grilled fish/chicken. They also do delivery, and offer online ordering via Just-Eat. Kake has ordered delivery food from them several times, most recently in March 2019. With one exception (and that was peak time on a Saturday evening) the food has always arrived fairly quickly, and the drivers are friendly. Coleslaw (£1.30 in August 2011) was OK, but the dried herbs they'd added didn't really work very well. Marinated olives (£1.30 in August 2011) were pretty tasty though, and a nice mix of different types. The pizzas are OK, though nothing special; even the thin-crust ones aren't really thin. A seafarer pizza, ordered in August 2011, had unexpectedly hot green chillies among the topping; I do quite like spicy food, but these were a little much for me. The prawns on the seafood pizza I ordered in January 2012 were definitely past their best; I'd noticed previously that their seafood wasn't always the freshest, but this was the first time the off flavour was strong enough that I wasn't really happy to eat it. Their grilled fish and chicken are pretty good, though. Grilled seabass and grilled mackerel (£9 and £7 respectively including chips, rice, or salad as of March 2019) have both always been well-cooked, with a nice char on the exterior but not overcooked photo from March 2019. Unfortunately in November 2011 they'd packaged the accompanying salad right next to the hot fish, so by the time it arrived it had wilted. Kake's verdict: I've given them quite a few chances with the pizza but I don't think I'll bother again. However, I'd happily have their grilled fish or chicken. I suspect that despite the name, they have a proper grill and are just doing the pizzas as a sideline. Food last sampled by Kake and bob, March 2019. Last edited 2019-03-24 10:10:15 (version 7; diff). List all versions. Page last edited 2019-03-24 10:10:15 (version 7).